An easy version of Vietnamese pho soup that’s made healthier with daikon noodles and packed-full of veggies. Perfect for slurping on a cooler day and easy to customize with your favorite protein. 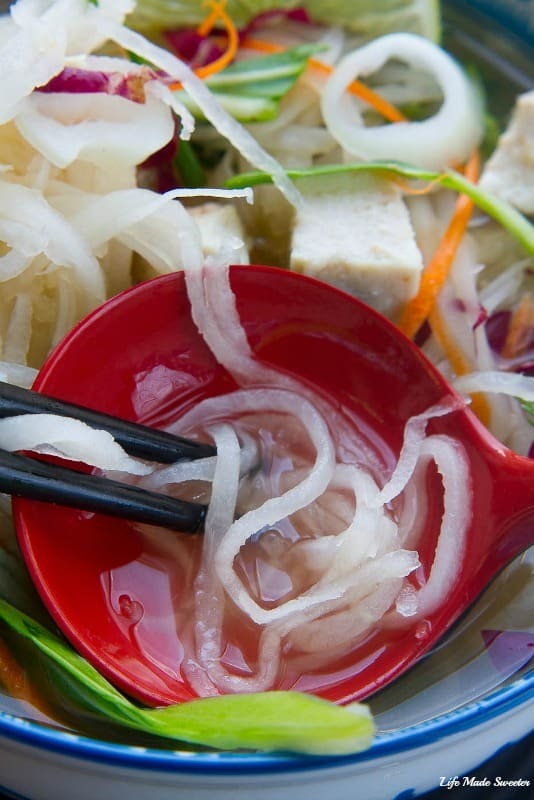 Have you heard of Pho before? Like “pho-gettaboutit.”? 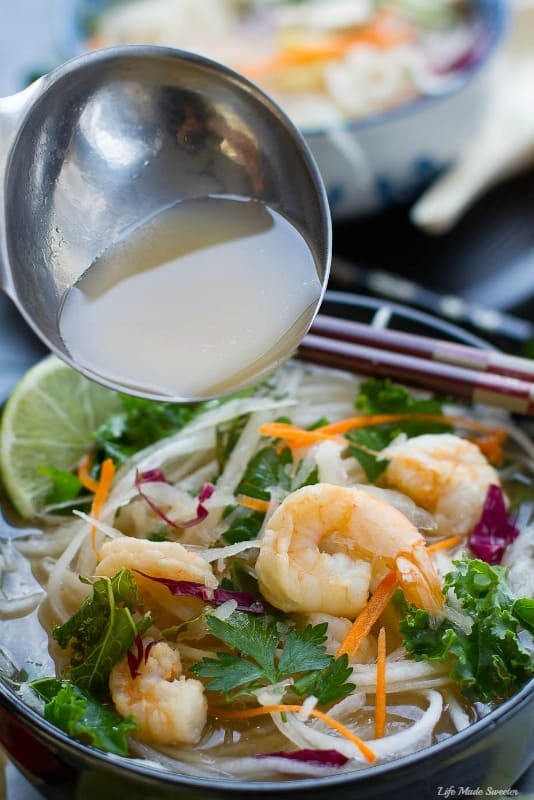 If not, it’s a wonderfully delicate Vietnamese soup, made with rice noodles steeped in an insanely flavorful broth. It’s often made with beef or chicken and topped with lots of fresh aromatic veggies. It’s the ultimate comforting dish to enjoy on a cold, rainy or snowy day. It was one of the foods I would crave for everyday when I was pregnant and it was especially satisfying after a few runs down the ski hills when the hubs and I used to go skiing. There’s just something about a piping hot bowl of the fragrant broth flavored with star anise, cardamom, fennel seeds and cinnamon that come together to create soup perfection. The best part about is that you can customize any and all the condiments you desire to make it your own. 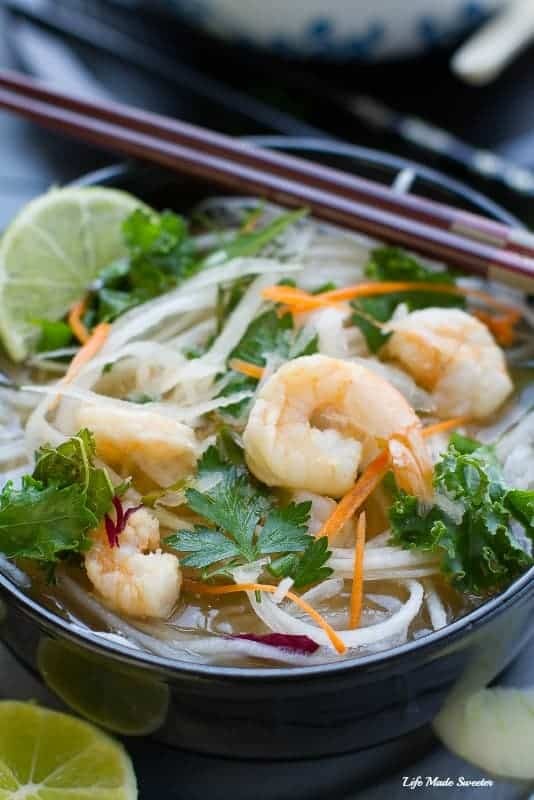 Pho is usually made with beef and you can find my version of it HERE (a reader favorite) but this time I based this recipe off of Ali’s recipe from Inspiralized with shrimp for the hubs and a meatless version for myself with tofu. 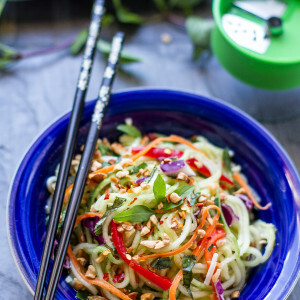 Instead of using rice noodles, Ali’s recipe calls for a lighter and healthier version using spiralized daikon noodles. With a spiralizer or a vegetable peeler, you’re able to turn almost any vegetable into noodles! The soup was nice and light which is perfect for this time of year when we’re still transitioning from summer to fall. Although it doesn’t have all the complex flavors you get from simmering all day like the traditional bowl of pho, it’s perfect if you’re short on time and need to get that pho noodle slurping fix. 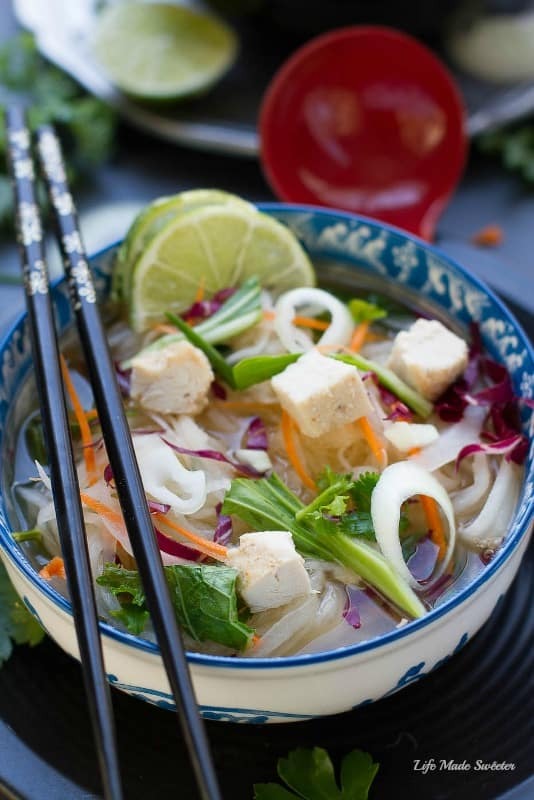 An easy Vietnamese pho soup that’s been healthified with daikon noodles and packed-full of veggies. Perfect for slurping on a cold day and easy to customize with your favorite protein. 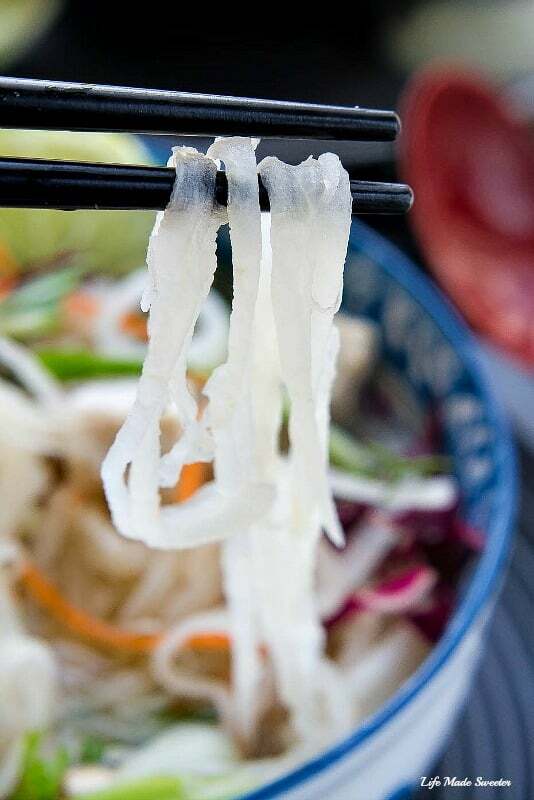 Use a spiralizer, julienne peeler or mandolin to turn the daikon radish to noodles. Bring the water, vegetable broth, fish sauce, lime juice, zest, and coriander to a boil over high heat. Lower to medium and season with salt and pepper. Add the lemongrass, ginger and chiles. Cover, and simmer for 10 minutes to let the spices infuse the broth. Toss in the shrimp and cook for about 8 minutes until they turn pink. Taste for salt and spices; you should have an equal balance of spicy, salty, and sour. Stir in the daikon noodles and cilantro, and cook for about 2 minutes more, until the daikon noodles are softened. Remove and discard lemongrass and gi5ger slices. Add bok choy, kale or other veggies to your liking. Serve the pho hot, garnishing with green onions, cilantro, Thai basil, onion slices, mung beans and Sriracha or hoisin sauce if desired. I received a copy of Inspiralized back in March and have been a big fan of zucchini noodles (aka zoodles) and other veggie noodles for about 2 years now. I love substituting vegetables for starchy foods which also seems to be the new trend of 2015. They’re great when you want a lower carb replacement for pasta or noodles in your dishes or when following a gluten free diet. My favorite reason is to add more veggies into my family’s life (something we all need to do). 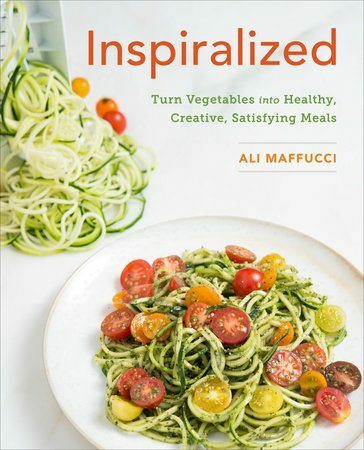 Ali Maffuci, a well-known food blogger, released the cookbook, Inspiralized back in February and it goes beyond zucchini to transform over 20 different types of vegetables into delicious meals. This book is so informative and full of helpful tips on where to start and shared her inspiring story on why she started spiralizing. Ali even breaks down the various noodles in different sizes and even instructs on how to convert the noodles to “rice” and specifics on what vegetables work and don’t work when spiralizing and what to embrace and not try with different vegetables as well. I love the diversity of the recipes like Mexican and Thai flavors as well as Italian and southern dishes, etc. This is not a vegan or vegetarian book so meat is also included in many dishes. I’ve tried a few recipes on here already including this Daikon Pho and next on my list to try are Spicy Butternut Squash Nachos, Noodle Chicken Soup and Collard Hummus Wraps with Golden Beets and Sprouts. And it’s not just a cookbook of pasta dishes. There are recipes for Breakfast, Soups Stews and Salads and even Rice Dishes and Casseroles and yes, there is even a dessert section. This book is quickly becoming well-loved and well-used at our house. I couldn’t possibly keep all this spiralized love to myself, so I’m also giving a copy of the Inspiralized cookbook to one lucky reader! Disclosure: I was provided with a complimentary copy of this book from Crown Publishing for this review. All opinions are 100% my own.